Steve Copeland created Menopod to provide discreet hot flash relief. It’s also great for relieving migraines and heat stress, too. Steve noticed that his wife, sisters, and friends lacked a good (and clean) solution to treat menopausal hot flashes. One friend resorted to chilled soda cans for cold comfort. Menopod is compact and easy to stow in your bag. And because there’s no ice involved, you don’t need to worry about water or condensation. The rechargeable device’s cooling magic comes from its copper plates. Turn it on, and the plates drop to around 41 degrees in a few seconds. 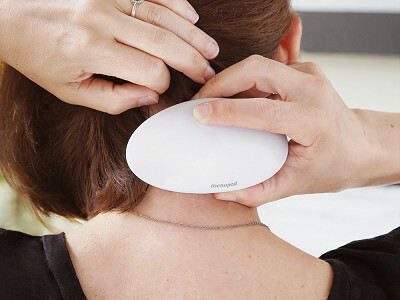 Touch the cold plates to your neck for a minute-long burst of cool relief. With all the thermoreceptors in that spot, it signals to your brain that you’re feeling cool. One charge powers the device for 12 one-minute cooling cycles—plenty of time to get you feeling cool and refreshed. Hello everyone. 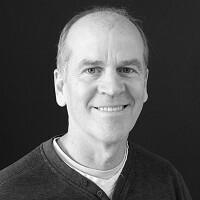 I'm Steve Copeland, designer of the Menopod and founder of Humantec. I look forward to answering any questions you have about Menopod and how it provides relief for hot flashes. Does it come in a bag or case? I would want something to protect it in my purse. I don't have hot flashes yet, but it seems like this would be useful to help cool off after exercise. Cool, but $139 is a little steep to me. @Alice Hi Alice, the Menopod has a patented thermoelectric cooling system housed in a very small mouse size housing. The Menopod will last for about two years so it is a very small investment when compared to hormone therapy or proposed natural remedies for hot flashes. @Steve why only 2years? What burns out on it ? Is it a lithium battery inside? Can the battery not be changed? @deanna Hi Deanna, there is a lithium iron battery in Menopod, not lithium polymer like Samsung. Lithium iron is extremely safe. All rechargeable batteries will lose their storage capacity after many charges so after about two years you would only get about three uses before needing to be recharged. My husband suffers from migraines. I'm intrigued by this product; have you done research to show it helps with migraines? There's only a one sentence reference to this in the video so I'm considering the $139 investment cost for helping my husband. Additional info? Thank you! @Jessica You can recharge your Menopod at any time. If the battery is completely depleted it will take a bout 3 hours to fully recharge. If I suffered from nasty hot flashes like some I'd be all over this in a hot second, regardless of the price. It looks compact so you can keep it at your desk; it's not messy; and you don't have to keep running back to the frig or freezer for it. Nice idea! @Tracie Thank you Tracie. Thousands of Menopod users all agree. Hi. I look forward to trying your product. I suffer from hot flashes and if this helps I will be sure to share your product information with my friends and family that also suffer from hot flashes and migraines. I really can't wait to try your product. @Julie Hi Julie, our best sales people are Menopod users. They talk to everyone they know about the relief they finally have in the palm of their hand. Hi Steve, I was curious about the same thing that Deanna asked about. @Gene Thanks for sharing your personal values here. Our team knows that many members of our community deeply value the ability to purchase only products made in the U.S. and we have an entire category of products devoted to this. However, we've also found that many of our Makers aren't able to manufacture in the U.S. While it's often ideal for them, it's unfortunately not always feasible. Again your thoughts here are truly appreciated. @Andrew Thank you Andrew. It is a reality of today's manufacturing that complex electronic devices, like Menopod and cell phones, are made outside of North America to keep these products affordable to the general public. What's with all the people who won't buy anything made in China? I guess they have never brought a product to market. In the real world it is impossible to manufacture a product like this in America and arrive at a price point where average (thrifty) Americans will buy it. Note: I have no relationship to to the Menopod team; but I'm thinking of buying one! @Julia Thank you Julia. We now live in a small world where we have the opportunity to work the best people anywhere to sell great products to people all over the world. @Steve I have to be completely honest here. First impression? Seemed high, but after reading more info, I was okay with it. Then I read it was made in China. As many companies convert to overseas manufacturing, the more determined I am to buy USA-made products. Have you seen the stores closing and the number of people unemployed? I know many people who still are not working at a qualified job....so no, I cannot justify made in China, especially at your pricing. So Steve, and Julia, et al, I am researching products and buying American despite price to help out my neighbor and my country. We appreciate you holding onto your shopping values, Donna, and thank you for the comment. Made in USA is a value we respect as well. That's why we created a collection celebrating those products. I don't know if this applies directly to Steve and the rest of his team, but sometimes it just isn’t possible for Makers to manufacture in the U.S. It can be expensive, inaccessible and overall, too big of a risk for a young company. And the desire to bring to market a really innovative tech product that will help a lot of people as quickly and as affordably as possible is quite powerful. Now, one way you can help them grow to a point where such an opportunity becomes more possible is by purchasing. But that is far from the only way. You're commenting because, I would assume, you are at least interested in this product. Share it with friends and family. Let people know about it. Word of mouth remains one of the most effective means of marketing and you can really help the Menopod team grow by sharing the message. I SO need this, but price is a bit steep. Does it also make an iced latte with extra ice for you? :-) ... perfect time to launch this - hot summer, menopause ... what better combination. If you just throw it in your bag with out a case, how does it stay protected? @Jacqueline Hi Jacqueline, the Menopod housing is made from high impact ABS plastic and has copper cooling plates. This will allow Menopod to stand up well against your plastic compact, keys and any of the other many things that may be in your bag. @Steve Thank you - I'm getting one. I need all the help I can get right now! Hi there! I'm wondering if this is sweat proof? The first place I seem to sweat is the nape of my neck. @Katie Hi Katie, sweat is a natural response to a hot flash to help you cool down through evaporation. The Menopod is water resistant so sweat away and just wipe it off afterwards with a soft cloth. Do not submerge the Menopod in water though. I love the idea of this! I would have loved using it during the chemotherapy-induced hot flashes I suffered with last year. When I go through that again (naturally), I hope this product is still around. Thank you for coming up with something to help. @Amy Hi Amy, we were approached by a hospital to do a clinical study to show the effectiveness of Menopod in assisting chemotherapy-induced hot flashes. We had given several Menopods to both male and female patients with great success. Menopod will be here when you need us. Steve Copeland created Menopod to provide discreet hot flash relief. It’s also great for relieving migraines and heat stress, too. Steve noticed that his wife, sisters, and friends lacked a good (and clean) solution to treat menopausal hot flashes. One friend resorted to chilled soda cans for cold comfort. Menopod is compact and easy to stow in your bag. And because there’s no ice involved, you don’t need to worry about water or condensation. The rechargeable device’s cooling magic comes from its copper plates. Turn it on, and the plates drop to around 41 degrees in a few seconds. Touch the cold plates to your neck for a minute-long burst of cool relief. With all the thermoreceptors in that spot, it signals to your brain that you’re feeling cool.